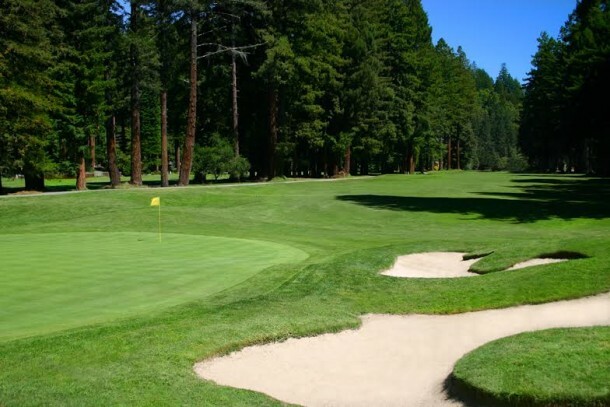 Northwood Golf Course was indeed designed by the same architect who created world class tracks such as Cypress Point, Augusta National, Royal Melbourne and Pasatiempo. 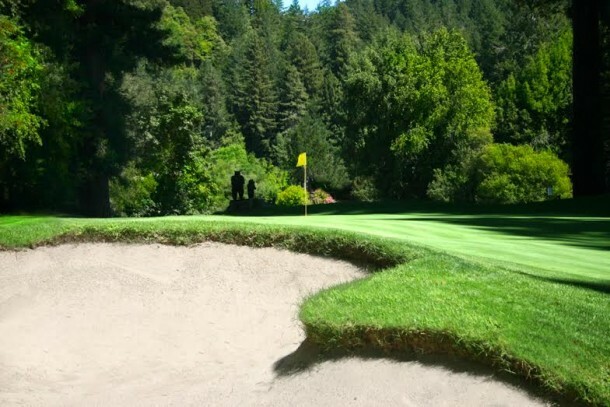 It is a picturesque and immensely walkable course nestled in a grove of redwood trees along the Russian River in some of California’s best wine country. It provides aesthetic beauty and challenge for both the low and handicap golfer. The course history is quite interesting as MacKenzie was asked to build the course so the Bohemian Grove members could have a place to play golf during the summer encampment. The famous Bohemian Grove is located just across the river from the course. The majority of the course has majestic California redwoods along both sides, but there is rarely a claustrophobic feeling. The opposite is actually the case as the redwoods provide a magical feel to the course especially in the morning as the fog lifts and the sun begins to pour through. The course opens with a dog leg left protected by bunkers. This hole is one of the few that allows for a wide open shot at the tee. A nice way to start your round. The hole is cut into a stand of redwoods. From the tee box, you cannot clearly see that the green is a modified punchbowl. Slicers will have the opportunity to visit the majestic redwoods that run along the right side of the fairway. It is best to approach from the right side but you need to be in the fairway. A beautiful simple par 3 with a green that is framed by the redwoods and a home at the back of the green. The fourth hole lined with redwood trees on both sides so the drive needs to be in the fairway. The layout is a dog leg right. A driver is not required but a skilled golfer can reach the putting surface with a well struck shot. The green is set from low to high making for some interesting putts depending upon pin placement. The shorter of the two 5 Pars and a possible birdie hole depending upon the accuracy and distance of your drive. If well place and of appropriate length you can reach the green in two. If you play it more strategically and go at it on your third shot a well-played pitch could allow you a realistic birdie putt. The green has MacKenzie style bunkering on the left side making this one of the more memorable greens on the course. 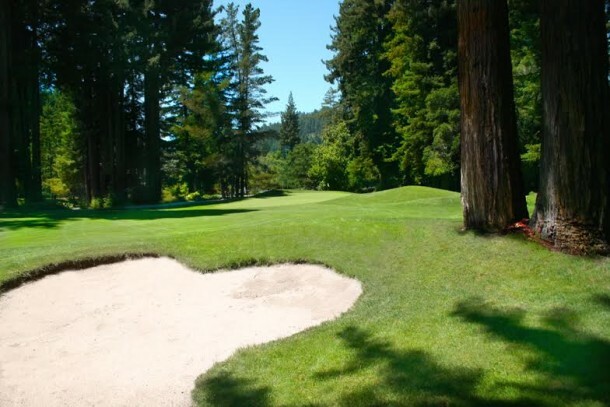 This dogleg left par 4 plays between a grove of redwoods. Your drive needs to be straight much like the 18th at Augusta. Your approach is into a sloping green that has bunkers on the right and left. A well-placed drive is required for a good shot into the green. Welcome to the Amen Corner of Northwood 7-8-9.To score, you need to do well on these closing holes. Number 7 is the longest par 4 and is a dogleg right. A well-placed tee shot on the left gives a good approach shot into a heavily bunkered green. A shot on the right makes for a challenging approach shot into the green. Placement is critical on this hole. The elevated tee box supplies a great view of the well guarded green. Lots of opportunity for bogie if you do not reach the putting surface on your tee shot. The number one handicap hole and the finishing hole of your first 9 at Northwood. It is quite a challenge to reach this par 5 in two shots so your second needs to be well placed. Your third shot is onto an elevated green that slopes back to front. Any approach to the back or over the green is hard to hold. The key is to stay below the hole. A fun but challenging finisher. Northwood is a great round of golf in a beautiful setting – The perfect walk. A few suggestions after enjoying nine at Northwood. Another nine! Stop by the Northwood restaurant for some sustenance. Or head off for some of that fabulous Russian River Valley Pinot Noir! Special thanks to Gaylord Schaapp who is General Manager and historian of Northwood for his help and insights. Click here for the Northwood GC website.